We have released version 4 of MsgExtract, our email extracting tool. The email parser now uses rules that can be sequentially applied to the original text, making it a lot easier to extract a part of a text. 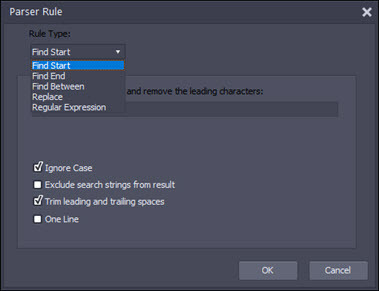 The following rules are available: Find Start, Find End, Find Between, and a Regular Expression rule. Alternatively, you can use a script in Basic or Pascal to parse and extract the text. The script editor has also been rewritten. You can define fields and store the parser output to them. These fields can be exported to several formats like Excel, CSV, XML, and others. You can also export the fields to a database. 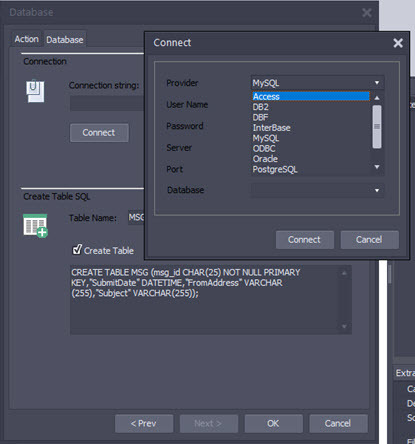 MsgExtract can now export the parsed email data to several databases, like MySQL, Oracle, Interbase, SQL Server and others. MIME is the standard format used by most email clients and email providers except for Microsoft that uses the MSG format. The MIME format is based on several standards (RFC 2045, RFC 2046, RFC 2047, RFC 4288, RFC 4289 and RFC 2049). It has been created in 1991-92 by Nathaniel Borenstein and Ned Freed. In 1993 the MIME format was blessed by the IEFT (Internet Engineering Task Force) as a draft standard. Because it is a standard, you can't go wrong when using MIME for saving your email. The disadvantage of this format is that links to external images will probably no longer work in the long run, meaning that you might not be able to see the complete email. The MSG format has been created by Microsoft, who owns the intellectual property rights. It is based on the Compound File Binary Format which, as they describe it, is similar to an FAT file system within a file. Microsoft Outlook is the only product to use this format. The MSG format specification has been released on 2009. It is widely used because of the popularity of Microsoft Office in the workplace worldwide which had been unchallenged for years until alternatives like Google Docs became popular. I would not recommend using this format for new backups unless you use MS Office and plan to keep using it. The external images linked in the email can also be lost in this format. The PDF format (Portable Document Format) was created and conceived for presenting documents in a manner independent of application software and operating systems. It was developed in 1990 by a team led by Randy Adams as a way to share documents and images between disparate systems. Its specifications were proprietary to Adobe until they released them as an open standard on 2008. Because it was designed to be universally available and independent of the computer where it is used, it has become hugely popular and has become the standard for archiving documents. It is the preferred format for email archiving because the external images can be included in the document and can be displayed as the original email. The Rich Text Format is proprietary to Microsoft and has been used for cross-platform interchange with Microsoft products. Use this format if you need to export your email to MS Word. It can store the messages compressed as either ZIP or Seven Zip and optionally encrypted with the AES format. It can also use a different encryption algorithm like AES, Blowfish, DES and others. It can save the messages compressed as either ZIP or Seven Zip and encrypt them in the AES format. The linked images can be downloaded and embedded in the generated pages as images. The email attachments can be embedded as PDF attachments so that you can open and save them using Acrobat Reader. It can include the email metadata inside the PDF file so that it can be used as an email source to be converted back to email. MsgExtract can read the PDF files and export them back to email. You can now export your help desk tickets from your favorite help desk software as email messages to disk or to an email client like Outlook or Gmail. Each ticket thread can be exported to one email with quoted replies or to several emails, one for each reply from the agent and the customer. We have improved the email export to CRM targets and added new integrations. MsgExtract searches your CRM for a user that matches the sender email address. If a user is found the email is either forwarded or created as a note. Optionally if the user is not found it can be created with a user defined tag. We have improved the integration with Amazon S3. Now it is possible to re-create the email source folder structure when backing up or restoring email messages from Amazon S3. MsgExtract's Printer Action allows you to print large amounts of email messages and its attachments, maintaining a correlative order. You can send email from any supported email source. The Printer Action prints first the email message and optionally if it has attachments, it prints them as well. It uses the Windows shell to find a program that can print the attachment's extension. It can print now image formats like PNG, JPG, BMP without using an external program. It can print Word and Excel files using OLE automation therefore not needing an external program other than Office itself. You can send email from email sources, like Gmail or Outlook to the printer and select which labels and folders will be printed. To fine tune the selection use filters. You can use the MailExplorer program to print only selected messages. The Printer action can print email messages and its attachments, maintaining a correlative order. It waits for the print job to finish before sending a new email or attachment to the printer. How are the attachments printed? Print Images - Image formats (PNG, JPG, GIF, TIF, BMP and others) will be printed when this option is selected. Print Word and Excel files - When this option is selected, Word and Excel files will be printed using OLE automation. You need to have office installed. Print other formats using their shell association - When this option is selected, MsgExtract will search for a program that can print the attachment filename extension, using the Windows shell entries. You should use this option to print PDF files. Print compressed attachments - Attachments that are compressed as ZIP files will be first uncompressed before printing them using the options above. Email saved as single files ( EML, MSG, HTM, ..) can now be 7-Zip compressed as well as encrypted with AES-256. Email saved as single files can now be encrypted with the following encryption algorithms: AES, Blowfish, CAST, DES, IDEA RC2, RC4, TEA, TripleDES, Twofish. Both 7-Zip compression and Encryption can batch encrypt email from all supported sources like Gmail or Outlook. You can batch decrypt email saved as ZIP, 7-Zip or the ones saves with the new encryption algorithms as well. You need to select the algorithm and enter the password and and the files will be automatically processed. It is possible to select the starting message and the number of emails that are going to be processed in all selected folders. The sampling filter allows you to process only a number of messages randomly selected in all selected folders at the defined source. You can now parse and export data from your email messages not only using regular expressions but also by writing a script in Basic or Pascal that will be executed for every processed email. This will help you to extract information from email messages easily and is an alternative to using regular expressions giving you a lot of power and flexibility.